John Morgan and Mary Flynn Morgan headstone in Bloomington IL. John Morgan and Mary Flynn were married in Moynalvey parish County Meath on 2nd March 1824. I am very lucky to have such an early marriage record for a family member. John and Mary were the parents of James – 1825, Jane – 1827, Patrick – 1830, William -1834, John – 1838, and Mary – 1840. The family moved to Bloomington, McLean County, IL. 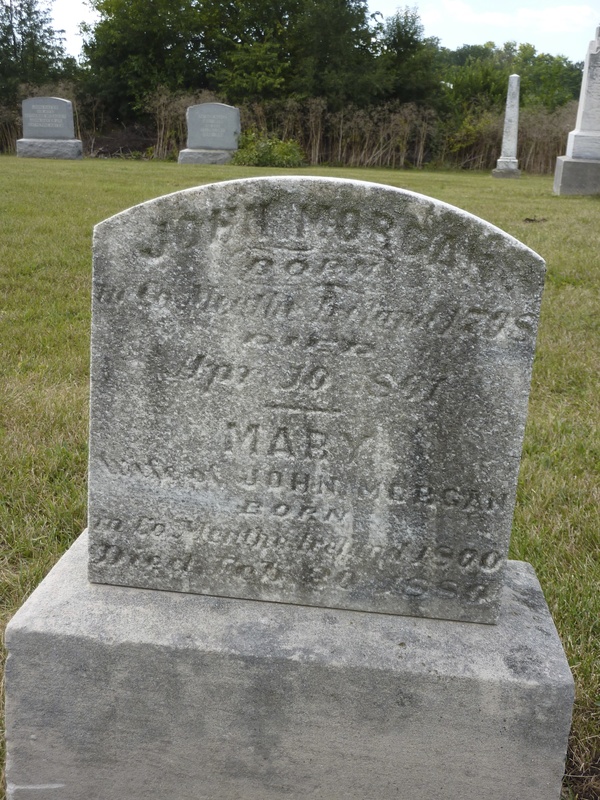 John died 10 April 1861. Mary lived until 20 Feb 1880. I am taking time this week to see if I can find any more information about this family. I did make an exciting discovery a couple of years ago. When I stopped to get the photo of John and Mary’s headstone. I discovered another headstone of Mary Morgan Hanley. I discovered that Mary was also a daughter of John and Mary Morgan. Mary Morgan’s husband was Edward Hanley who was also from Moynalvey County Meath. I identified Mary in her brother’s obit. It is exciting to find a new branch of the family tree. A couple of years ago I found out that they don’t have have any records for people who might have worked in the ‘Secret Service’ during the Civil War! William and Rose Morgan are buried in Exeter Nebraska. I am a descendant of William and Rose Morgan’s daughter Anna Morgan who married John Neville.